By default, the DisplayFusion taskbar will match the behaviour of the Windows taskbar, but did you know that the DisplayFusion taskbar has a wealth of customization options that you can configure to best suit your needs? The customization options are per-taskbar settings. To access them, right-click a blank space on the taskbar itself and navigate to the Multi-Monitor Taskbar sub-menu. There you'll find a list of further sub-menus for each element containing the configuration options for each one. If you'd like to reset all of the taskbars to the default settings again, you can use the "Reset All Taskbars" button on the DisplayFusion Settings > Taskbar tab. There are also some settings that affect all of the DisplayFusion taskbars. These settings are located on the DisplayFusion Settings > Taskbar tab. The DisplayFusion taskbar allows you to add different types of shortcuts to the taskbar. You can add regular application shortcuts, like the Windows taskbar, but you can also add shortcuts to files, folders, and websites. By default, new windows opened from shortcuts on the DisplayFusion taskbar will be forced to move to that same monitor. This can be changed in the Taskbar Shortcuts editor. 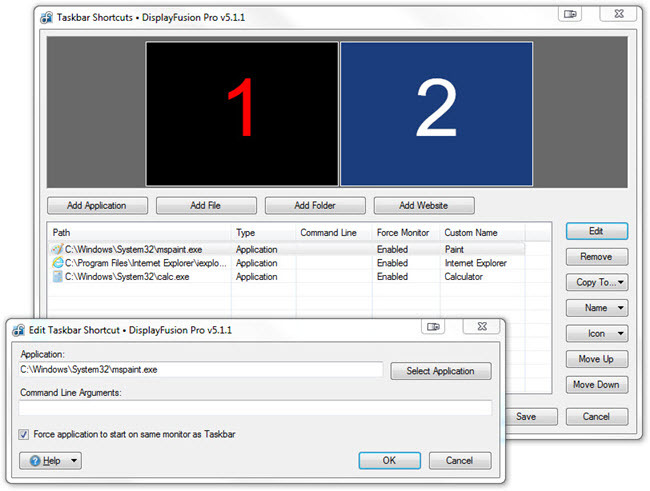 Adding application shortcuts can be done by right-clicking a button on the DisplayFusion taskbar and choosing "Pin this program to Taskbar." For the other shortcut types, you'll need to use the Taskbar Shortcuts window, accessible via the right-click menu on the taskbar, or by clicking the "Taskbar Shortcuts" button on the DisplayFusion Settings > Taskbar tab. From there you can add all of the shortcut types, and also edit, rename, re-arrange, and specify custom icons for the shortcuts. Here are a few sample screenshots of different taskbar configurations. This tells you WHAT you can do but not HOW. Kind of useless. All of these options are available by right-clicking in a blank spot on the taskbar. Please see the first screenshot for reference. It would be great if there was an ability to limit which applications displayed on one of the taskbars. Such limitations could help manage multiple windows more effectively. Instead of creating a 2nd taskbar for the 2nd monitor is it possible to extent the Windows taskbar so that start menu is on the left of 1st monitor and date/time on the right of the 2nd monitor (sietup to be the right of the 1st monitor)? It would be helpful to be able to set a Multi-Monitor Taskbar, but have the same system tray clock (as I have added two more clocks for different time zones for family members). Is this possible? If so, how? @Paula: Are you wanting the extra time zones to show in the tooltip for the clock? Or right on the taskbar? is it possible to remove the windows 10 taskbar completely and only use the DisplayFusion taskbars? then you can set the win taskbar on auto-hide and move it to the side of the screen for example. its a workaround but I think it is the only thing you can do for your main monitor. I would know if it's possible to desactivate the default Windows taskbar and replace it by the your? I have Win10 and two screen, i can do what i want on my second screen, but on the first screen either i only have the Windows or i have both of windows and your..
Would it be possible to add some "semi-grouping", like there is on the normal windows task bar? By this I mean that, when you try to drag e.g. Skype around on the task bar, all the Skype windows move together as one unit, and more importantly, they open besides each other. So the real feature request is that windows that belong to the same group, open next to windows of the same group, instead of just opening it at the end of the task bar. Since there already is functionality to group windows, it should be possible to do a small check of whether a window of the same group is open, then place the windows next to that. This could of course be some kind of toggle feature, for those who like the current implementation. On another note. It might be worth to update the pictures in the original post, since most people (i guess) use Windows 10, and the general UI, has received an overhaul. I cannot for the life of me figure out how to get Windows 10 Sticky Notes on my secondary displayfusion taskbar. I can't find it using the browse function from the displayfusion settings or anything. I can't open it to that monitor using the start menu on that monitor, it just opens on the primary taskbar. Can someone help me get a shortcut to Windows 10 Sticky Notes on my secondary taskbar? it's not in the add application or add file browse, and search doesn't find it. I am running the latest version of Windows 10 Home, all updates installed. I can't find Sticky Notes anywhere, but clearly I'm using them via the Microsoft Store App. How do I add them to my displayfusion secondary task bar? @Phaewryn: It looks like the Sticky Notes app is doing something special, as it doesn't show up in our normal detection methods for running/installed Universal apps. I've added this to our list to look into further. Is it possible to add taskbar shortcuts to the primary monitor? I don't seem to have the right click menu on the taskbar for the primary monitor either. @Gianna: Unfortunately not. DisplayFusion doesn't replace the Windows taskbar on the primary monitor, so it doesn't have any control over it. Sorry! One of my little pet peeves about DisplayFusion is that when you open anything in Control Panel, DF taskbar shows it as a Windows Explorer window rather than the Control Panel icon. Other than that, DF does exactly what I need it to do! @Mezlo: Is this in Windows 7 or Windows 10? I am sorry for the extreme delay in responding. When I hover over for the tooltip, it only shows the date. Perhaps you are saying that it would be possible to have it show the additional time zone as a tooltip. However it can be available - either as a tooltip or right on the taskbar, as long as I can view the different time zones, that would be perfect! Thank you for your patience with my getting back to you. @Paula: How did you add the extra clocks to the Windows taskbar? Did you have to use a third-party app? While I'm not Paula, adding extra clocks to the taskbar is trivial in windows 10: Click on the taskbar clock, then "Date and time settings", then "Add clocks for different time zones", check the "show this clock" checkbox, choose the time zone, enter a display name, click Apply. Now it will show both (or as many as you want) timezones as a mouseover. Yes, thank you Phaewryn. I did that prior to initially posting... and it works, on my main (1st) monitor. But when I hover (or mouseover) the date / time on the 2nd monitor, it only shows the current time zone. It seems trivial, but I have my computers arranged to my liking and the 1st monitor is a considerable distance from my 2nd monitor, where I do most of my work. If this would work on the 2nd monitor, that would be sufficient. Yes, which that third party app no longer works. Now the issue is just having the hover work on the 2nd monitor... please see post just before this one. Ah, right, I see what you're getting at. That is actually a rather odd little bobble in the program, isn't it? It clearly displays my customized "show both 12 and 24 hour times" hack which I did in "Date and Time Settings/Additional date, time, & regional settings/Set the time and date/Change date and time/Change calendar settings/Customize Format/Time/Short time: h:mm tt - H:mm TT" on the second taskbar, but you're right, it does not show the additional time zones, or for that matter, any mouseover action. I suspect they just need to add the mouseover functionality (tooltip, whatever microsoft wants to call a mouseover)? One other thing that's always annoyed me is that the clock on my secondary taskbar is in a different color font than on my primary monitor. A little thing, but annoying none-the-less. I use a high-contrast theme, and the DF taskbar clock just does not seem to understand it at all. Huh, doesn't do that on mine. Shows correct icons on secondary DF taskbar (Windows 10). Ah yep, I see what you mean about the tooltip for the additional clocks. I found a ticket for this on our list so I've added your info to it. @Phaewryn: Which High Contrast Theme do you have selected? I'll test this out. I'm pretty sure they started as Windows's "High Contrast Black", and then I went in and tweaked from there, so probably any of the High Contrast Themes in Control Panel\All Control Panel Items\Personalization would replicate the issue. To make one, you have to go into there and choose one of the existing high contrast themes, change some stuff using the UI, then "Save theme," then go into the theme folder and edit them in notepad++ (I think it might require administrator privileges to save in that folder, been a while since I built a theme). Thanks! Do you also have the "Taskbar: Force Classic Style" option enabled in the Advanced Settings window? Sorry, I should have clarified, do you have the "Taskbar: Force Classic Style" option enabled in the DisplayFusion Settings > Advanced Settings window? Ok, strange. Could you send us some screenshots via our contact form of the difference between the Windows taskbar and the DF taskbar when you have that theme loaded? Done! Look for message from Phaewryn with your name in the subject. Here it is (attached) here as well. FYI, I did follow your previous advise at https://www.displayfusion.com/Discussions/View/multimonitor-taskbars-two-very-different-colors-one-aero-one-not/?ID=35a1b18d-e1cd-4a10-bf3b-71ba1bbbb55b and so that setting is set to "Don't change the Aero color". What's the recommended size for the Custom Icons for my shortcuts? I currently have a taskbar on my second monitor, set to 36px width (it's on the left side of the screen). All the PNGs that I've uploaded (which look great when used as normal icons) are pixelated and have hard edges (like AA is turned off). What's the recommended size for these? Could you attach the PNGs here? I'll do some testing with them and see what I can find out. I have three monitors. I have the windows start bar on one monitor, and displayfusion's start bar on the other two. I want to know if it's possible to extend the start bar only to one of my other two monitors, without changing any other settings. Please let me know, and apologies if this has already been asked. @Allison: It sure is! For the monitor that you don't want it on, right-click the taskbar and choose Multi-Monitor Taskbar > Position > Disabled. Is it possible to use DisplayFusion to display a taskbar on my secondary monitor that shows the time in 24h format, including seconds, while my standard Windows taskbar displays 12h time without seconds? I have 4 monitors. I would like 1 of the 3 DF taskbars to show HH:mm:ss, while the other 2 DF taskbar and the default Windows taskbar to show hh:mm. The setting you showed affects all DF taskbars. I'd like it to affect just one. Ah ok, we don't have a way to set the clock text differently for each taskbar, no. If we're able to separate them out in the future I will be sure to post an update.